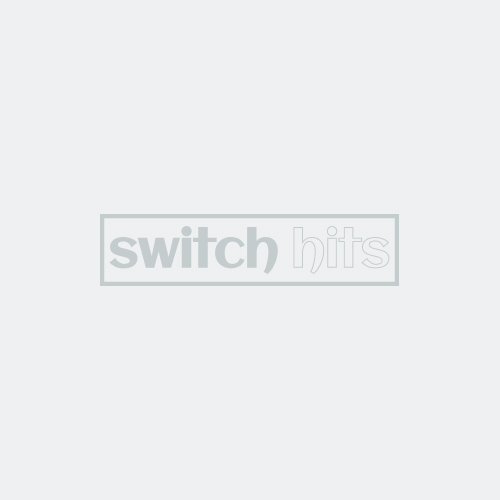 Switch Hits offers the striking Diamond Abstract switch plate in multiple configurations. Glass enameled metal light switch plates. Nylon screws provided by artist are included. Do NOT overtighten. Switch plates have glass veneer which may chip with too much pressure. Clean Diamond Abstract light switch plates with mild soap and warm water. Do Not use abrasives. 8.5 w" x 5 h"
4.75 w" x 5 h"
#1 Diamond Abstract Wall Plate & Outlet Cover vendor. Widest selection in stock. Immediate & Free Shipping. 5,000+ Reviews.